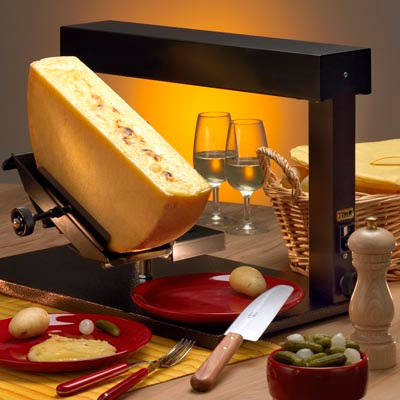 Raclette is a traditional Swiss dish. 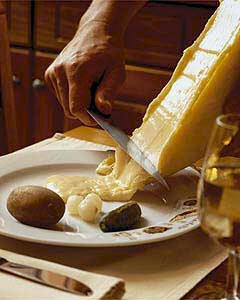 Raclette is also the name of the cheese that is involved with this Swiss dish. You have this half moon of cheese on a stand, and there is an open flame, or a heat source of some kind that melts just the edge of the cheese, and then you scrap it onto your plate. The food you generally see eaten with a swiss raclette is potato and sweet pickles.. like gherkins. When I first attended a Raclette dinner, it was nothing like this. It was with a grill, little frying pans, and tons of different foods and sauces. Like a fondue but not. That was over 20 years ago, and my french mother-in-law (I have two, one is french, and one is not), hosted it. What a blast it was, and I always wanted to own a raclette, but they were super expensive and not in my budget. With an "Canadianized" Raclette supper you grill what ever you want on the top of this small table top grill, and then load up your little fry pan and top it with a soft melting cheese of your choice, place it under the grill and wait for the cheese to melt. You slide it off of the non stick pan, onto your plate and enjoy with whatever sauces are around the table. My dear friend Karen was given a Raclette about 15 years ago and didn't know what to do with it. We planned a raclette supper with her family but it never transpired. Before she moved away, she left the raclette with me to use with the promise that when she comes back here, I will give it back!! I have used it only a few times, but each time, we come up with a different way to use it. Here's the lost blogging moment... Last night, I had my two dearest friends and their hubby's for supper and I prepared a "Mexican" Raclette. Now, that isn't really possible, since Raclette is a swiss dish, but we put a Mexican twist on it. I marinated chicken in fresh coriander and lime slices, and beef was marinated in a fajita marinade. We had onions, peppers (even some hot ones) corn, mushrooms and potatoes. A couple of melty cheeses (I used part skim mozza-which didn't really melt that well :( and some yummy salsa's, guacamole and sour cream for sauces. 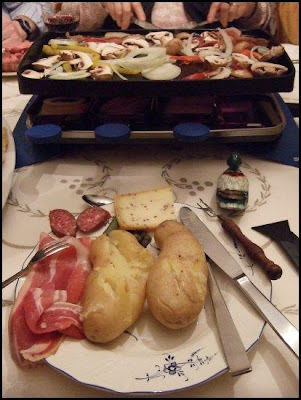 I used the word "Raclette" 12 times in this blog.. and spell check didn't like any of them! Donna, I have heard that word but never had a clue what it meant. Thanks for the fun sharing. Having friends over and eating anything is so fun. I enjoyed Raclette with you a couple of New Years ago. It was good. Mexican sounds wonderful. Send those left overs this way. I'm hungry. Even better when shared with friends, I am sure! Looks so fun! and yummy! sooooo not like you to NOT take pics!